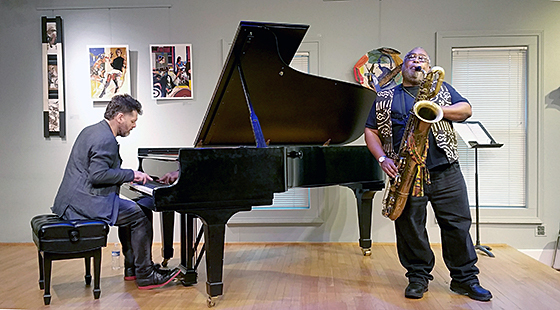 Baritone saxophonist Alex Harding and pianist Lucian Ban joined forces on the Kerrytown Concert House stage on April 15 to produce some great music. I was not surprised they met fifteen years ago in New York City since they have developed a very simpatico approach. We are lucky that Harding has decided to return to Detroit and is able to bring some of his musical associates from the Big Apple here. One of their first pieces was a tribute to the recently departed avant-garde pioneer Cecil Taylor, and it had much of the rapid fire associated with Taylor. This was followed by a slow gospel/blues piece where the two got into a solid groove. Harding’s robust sounds were complemented nicely by Ban’s muscular piano.